As world leaders convened in 2015 to agree on Sustainable Development Goals and a new climate deal, the Forum was leveraged this historic opportunity to shape the world’s development agenda for decades to come. Over the past two years, the Global Landscapes Forum has evolved into the world’s leading platform for discussing land-use issues. In Paris, the Forum brought together more than 3000 stakeholders from forestry, agriculture, water, energy, law and finance, among others. The Forum is organized by a cross-sectoral consortium of leading international organizations, led by the Center for International Forestry Research (CIFOR). Over 100 organizations from across the globe hosted Discussion Forums, Launchpads, Landscapes Labs and be part of a Thematic pavilion. See concept note: 2015 Global Landscapes Forum. In 2013, the organizers of the six Forest Days and the five Agriculture and Rural Development Days joined forces to launch the Global Landscapes Forum. Ahead of COP20 in Lima, this partnership was broadened to include even more voices from landscape research and policy. To date, more than 100 organizations have shared their research and ideas through the Global Landscapes Forum. 450 students and young professionals joined the 2014 youth session, master-classes and webinar, led by 25 mentors from business, civil society, government and research organizations. The 2015 Forum took place on 5-6 December at the Palais des Congrès in Paris, on the sidelines of the UNFCCC COP21. More than 3,000 people joined the Forum. The year 2015 constitutes a major landmark for climate and development policy as countries are set to agree on climate action beyond 2020 as well as on the Sustainable Development Goals (SDGs) to replace the MDGs. 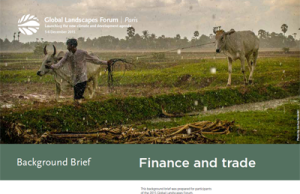 In parallel to these important international policy processes, the 2015 Global Landscapes Forum gathered evidence for implementation and explore measures of progress. Strengthening the role of indigenous peoples and local communities in land management decision-making to improve outcomes for nature, climate and people – looking at REDD+ safeguards, tenure, but also the broader development agenda and its relation to landscapes. The Forum saw more than 30 sessions facilitating science–policy–practice conversations along four themes. Sessions were selected by an interdisciplinary science committee. Sustainable Development Goals and climate change mitigation and adaptation were crosscutting themes. Recent international initiatives have recognized the role of landscape restoration in achieving sustainable development and climate goals. Governments, companies and development organizations pledged substantive support to reaching restoration targets. It is now time to reflect on lessons learned. Sessions under this theme tracked the progress that was made and showed approaches for making landscape restoration a success. Learn more. Disputes around tenure place limitations on the effectiveness of climate and development initiatives such as REDD+ and private investments in land-use sectors for sustainable land management. At the same time, an increased flow of finance into developing countries will have profound impacts on formal and informal institutions. This theme focussed on important issues such as implementation of REDD+ safeguards, gender and access to land, law and governance frameworks and rights of indigenous peoples in the context of landscape approaches. Learn more. Access to finance for rural communities is inadequate and comes at high interest rates. Similarly, current levels of funding for REDD+ and other conservation and climate initiatives are insufficient and unreliable. Innovative solutions in the world of finance and efforts by the private sector to improve practices could lead to more sustainable land use. Under this theme participants explored effectiveness of these initiatives, how they could be scaled up and which indicators are needed to track environmental and social impacts. Learn more. Tracking the progress countries make in achieving the new climate and development goals will be critical in the coming years. Sessions under this theme identified and launched the tools and instruments needed to measure progress at the landscape level. Topics included technological innovations that help us understand land-use change, multi-stakeholder engagement in MRV, assessing the social and environmental impact of zero-deforestation pledges, and the role of knowledge support tools as well as landscapes in SDG targets and indicators. Learn more. The 2015 Global Landscapes Forum built on successful features and lessons learned from previous events and allows for maximum stakeholder engagement across all levels. Plenary Sessions provided invaluable opportunities to hear inspiring thoughts and news of future developments from experts and prominent speakers from diverse backgrounds. Discussion Forums, the most popular feature of previous events, set the stage for interactive science–policy–practice dialogues. Launchpads provided an ideal platform for presenting new research and initiatives. Launchpad applications were evaluated by media and communications experts based on relevance, innovation and media interest. Landscapes Laboratory stations showcased how open data, geospatial technologies, and the Internet are revolutionizing our ability to monitor and manage the natural world. Thematic Pavilions created spaces for exchange and networking around topics cutting across all Forum themes – such as gender, technology and innovation, climate change and food security. Individual Booths provided exhibition space for organizations who preferred to display publications and products outside thematic pavilions. Speed-Networking incentivized conversations between stakeholders who would not have met outside the Forum, structured along common interests and challenges. VIP Luncheons provided a setting for policy makers to share ideas in an informal context. The Photo competition invited world wide audiences to submit their photos and win exciting prizes. The Pecha Kucha-style Night gave individuals and organizations the chance to present about landscapes in a dynamic and concise way. The Youth in Landscapes Initiative included a capacity-building component, online engagement opportunities and a youth session aimed at 300 students, young professionals and their mentors. The Global Landscapes Forum is unique in that it connects the annual event to year-long outreach activities. The collaborative, unbranded website archive.globallandscapesforum.org serves as an online information hub around landscapes and climate change. In 2015, Forum organizers introduced new tools for online audience engagement. Capacity-building activities for youth and social media professionals took place in Paris during the days leading up to the Forum.